Welcome to Episode 13 (gulp!) 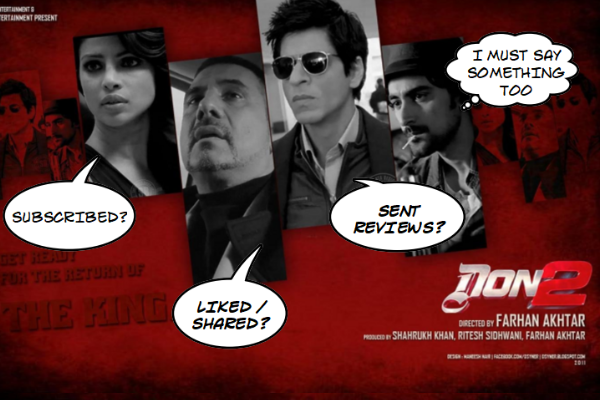 of the Khandaan Podcast where we discuss 2011’s Don 2, starring Shahrukh Khan, Priyanka Chopra, Boman Irani, Lara Dutta, and Kunal Kapoor. In this podcast, we talk about the consistently high production values of Excel Entertainment that allow it to make movies that don’t age as badly as other Bollywood product. However, how far can technical excellence take you when the writing is merely ho-hum? This episode left Asim, Sujoy and Amrita with more questions than answers – will Farhan ever make another movie? Were PC and SRK destroying Bharatiya Sanskriti during this film? How hot is Lara Dutta? Etc. We also discuss the blockbuster new release Veere di Wedding and the amazing response it has received from male reviewers who are massively upset with its brand of female power. We also look at the many controversies that emerged from this film, including Swara Bhaskar’s infamous statement about Pakistan. A few words are also spared for Bhavesh Joshi, a movie that dared but couldn’t bear (any fruit at the box office). Asim looks forward to your outraged responses to this podcast! He would also like to remind you that Khandaan is currently accepting nominations for our special run, which begins with episode 15. Send us your listener’s picks on upodcasting@gmail.com.